What makes Live Lingua German different? Here are just a few of the reasons to study with us at Live Lingua German. 1-on-1 German classes any day of the week. Our German teachers have years of experience teaching German to foreigners. 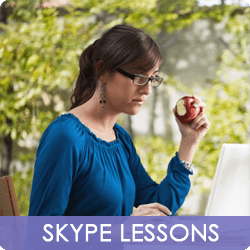 All of our Skype German tutors can speak a second language. Native German speaking teachers from Germany. Each German lesson lasts for 60 minutes. Total flexibility for German classes. Enroll in as many or as few hours as you would like. Here is what some of our hundreds of students have said about their Skype German lessons. "This was the 3rd Skype German service I had tried. The first two were online directories with German tutors, but the quality of the teachers was very low, and there was no actual staff to help me if I had problems with the teachers. Live Lingua [German] school is a much better option. I have had 2 tutors with them and both have been excellent, and I like knowing that there is a real person I can talk to take care of any problems I have with my classes. If you are like me and looking for a better option, Live Lingua is the right choice."